A friend of mine came up to me recently and said his feet were killing him while doing the Insanity workout. He was excited to have lost about 20 pounds by day 45 but he was having to skip days because of the pain. He isn’t the first one to have told me this. His brother who deals with Plantar Fasciitis actually told me the same thing when he was going through it. If there is one thing that Insanity will do is challenge your feet and knees. He was dealing with a couple of the issues I have to deal with when working out at home. The only space he has available to do it in is a area with hardwood floors. The constant jumping and lateral movements during the workout put a lot of pressure on the bones in the lower body. His brother told me he loved the concept behind the workout but wished there wasn’t so much jumping or one less day a week of leaving the ground. This way the lower body has a chance to recover and doesn’t lead to future injuries. I agree. What Can You Do To Stop Your Feet From Hurting? Buy New Shoes – You would be surprised how quickly shoes get worn out. Especially when they look like they still have 6 months of life to them. I have made this mistake a number of times. I guess Im still looking for the perfect shoe. Walk More – Do you get enough steps in every day? Its important to stand up and get the body moving. Don’t Go From Sitting To Insanity – Its admirable you want to get your workout in after sitting at your computer for 4 hours but you’re probably stiff. Get loose first. Go Barefoot – Walking around barefoot will strengthen the bottom of the feet. Do this around the house. Don’t do this when doing Insanity unless on carpet. Workout On Carpet – If you have to move some stuff than do it. Workout Outside – Weather permitting of course. I did almost all of the Insanity Asylum workout on the grass. I have to because my house is small and there just isn’t the space. 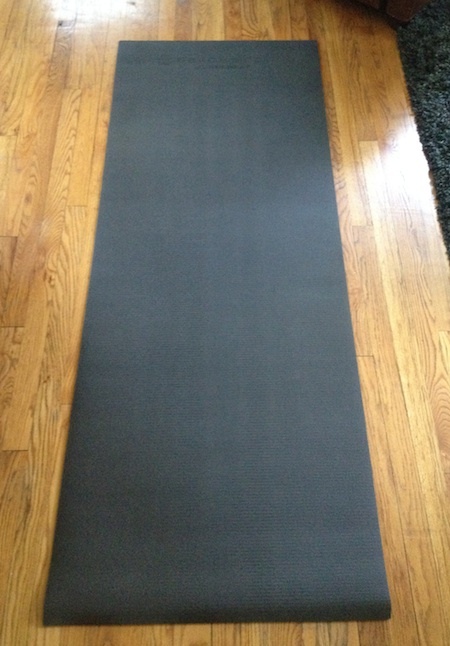 Beachbody Jump Mat – This thing has been a savior for me. I use it in almost every workout I do now. Its easy to roll up and put away along with providing just enough padding to protect my knees from being hurt. For $60 its the least you could do for your knees. Sometimes I’ll put my yoga mat under the jump mat for a little bit extra cushion. The best thing you can do to prevent injury when doing Insanity is to practice good form. I made that mistake the first time through Insanity. You get so focused on trying to keep up with Shaun T that you forget to pay attention to what you’re doing. When you go slower and learn the moves it forces you to do it correctly. As your strength builds up so will the speed. There will be less force applied to your knees, ankles, and the rest of your body as your muscles are now picking up the slack. If you are having problems with your feet when doing the Insanity workout then try a couple of the tips above. Your body will thank you and results will come faster. Is this program safe for people that have had joint replacement? Thats a question you need to ask your Doctor. I’d probably so no because its a lot of jumping.